On Saturday at Belmont Park, Amerman Racing's Oscar Performance made his long-awaited return a memorable one, driving to a 1 ½-length victory in the Grade 3, $300,000 Poker for 4-year-olds and up at a mile on the Widener turf course in a record-setting time of 1:31.23. Oscar Performance's final time was .40 seconds better than Elusive Quality's nearly 20-year-old mark of 1:31.63, set with a six-length win in the Poker on July 4, 1998. The Brian Lynch trainee also tied the world record time for a mile on the turf set by Mandurah on June 6, 2010 at Monmouth Park. The race was the first for Oscar Performance, a 4-year-old ridgling by Kitten's Joy, since he tired to a ninth-place finish in the Breeders' Cup Turf on November 4 at Del Mar. As a 2-year-old, Oscar Performance won the Grade 3 Pilgrim before capturing the Breeders' Cup Juvenile Turf and, last year, proved himself the top sophomore on the grass with three straight wins in the Grade 3 Pennine Ridge, the Grade 1 Belmont Derby and the Grade 1 Secretariat. Voodoo Song was another length back in third, followed by Fire Away, Ballagh Rocks, Force the Pass, Black Tide, and Vulcan's Forge completed the order of finish. Sent off as the 3-1 second choice, Oscar Performance returned $8.10 for a $2 win wager. Saturday's win boosted his career record to seven wins and a third from 12 starts for $1,967,632 in total earnings. “Great performance,” said Lynch. “Absolutely thrilled with his comeback effort. He did it with authority and came back with a very fast time. That's a longstanding track record to break so to have him do that off the layoff makes you look forward to the rest of the year. I thought they were cooking early and he was in a good location. Jose got him to the outside and as they rounded the turn it looked like he was moving and he's such a talented horse. 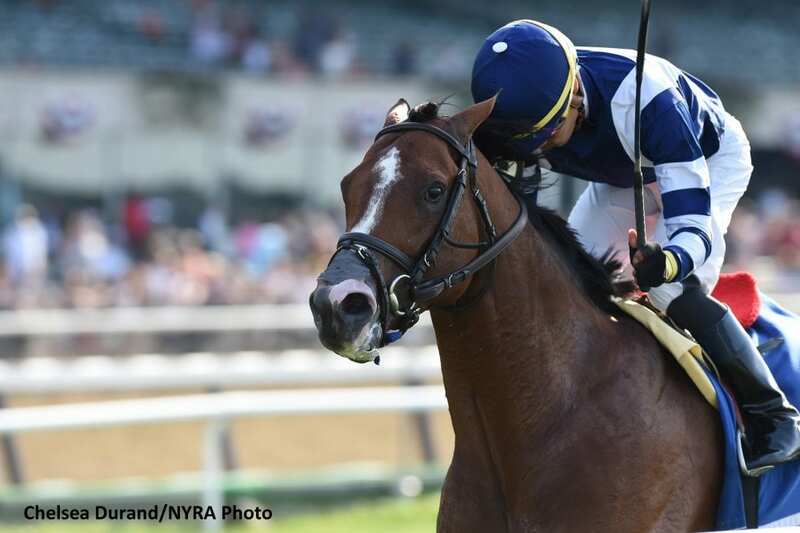 This entry was posted in NL Article, Racing and tagged amerman racing, belmont, belmont derby, belmont park, brian lynch, elusive quality, jose ortiz, kitten's joy, oscar performance, poker, poker stakes, secretariat stakes by Heather Pettinger/NYRA. Bookmark the permalink.